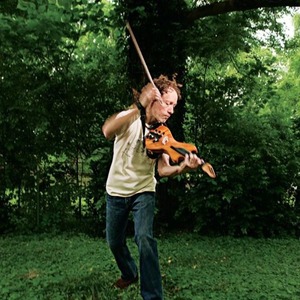 We invited legendary electric violinist Tracy Silverman to tell us about what inspired him to create his groundbreaking new books on Strum Bowing. Simply put: There was no defined pedagogy for learning the rhythmic bowing required for non-classical styles, such as jazz, rock and others. Because of this, the violin and other bowed string instruments have essential taken their place as melodic instruments, with little to no role in providing rhythm to an ensemble. 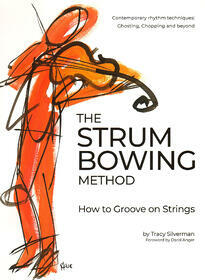 Tracy Silverman’s books are destined to greatly broaden the role of stringed instruments in music making across genres, by enabling classical players to expand their repertoire of techniques. This fascinating article shines a light on how this situation has come about, and how the new pedagogy will enable any player to develop the tools needed to become a Total Violinist. Contrary to popular belief, string players can swing, they can groove and they can rock out. The old refrain, “strings can’t swing”, may be our past, but it doesn’t have to be our future. String players can be just as effective in a rhythm section as a guitar player. In fact, strings can easily hold down a groove without any rhythm section at all, as fiddle players and string bands can attest. So, what is the key to connecting with the groove and why is it so elusive for many classical string players? Let’s start with the 2nd half of that question. The first point is pretty self-explanatory. It’s hard just to get a decent sound out of a string instrument, so our pedagogy tends towards solving that problem: bow control, pitch control, etc. This process of building the fundamentals of control of the instrument can be the primary focus for several years. Compare that with a guitar student, who may become proficient at basic strumming within the first 15 minutes and then moves on to learning tunes. Or a drummer, who learns how to hold the drumsticks in the first week or two and quickly moves on from the how of producing a drum sound, to the what of playing rhythmic patterns. Music can be divided into 2 very general categories, and they are like yin and yang: melody and rhythm; voice and movement; vocal and physical. Sustaining instruments generally cover the vocal-like melodies and non-sustaining instruments cover the rhythmic grooves. The difference between string instruments and guitars is the bow and the bridge. Because we use a bow to produce a sustained, vocal-like sound, our bridge is arched in order to allow us to play one string at a time. This vocal focus was always the point of string (and brass and wind) instruments and what set them apart from percussion instruments, guitars (or lutes, back in the day,) and keyboards (except for organs,) all of which have sharp attacks and quick decays of the sound and are well suited to play fast subdivisions of the beat. In fact, the modern bow was developed in order to bring out the legato qualities of the instruments, as opposed to the baroque bow, which produced a lighter sound, (with a quicker delay, more like plucked or percussion instruments,) and lent itself better to quicker rhythmic playing. This was a point that was brought out to me by Berklee College of Music String Chair, David Wallace and which he wrote about in my book, The Strum Bowing Method. Our function in an ensemble is to be melodic on top and to provide sustained bass on the bottom. So we let the other instruments worry about the groove. This is perfectly understandable, but it does make us very lopsided in terms of the yin/yang of melody and rhythm. Keyboards, although primarily fast decaying percussion instruments, can still play melodies, as can guitars. Even drummers can play melodies using marimbas or different pitched drums. Just as the yin/tang of melody/rhythm tends to find equilibrium on a keyboard or guitar, we should seek a similar balance on strings. That means more rhythm. Classical string pedagogy relies almost exclusively on the music of 18th and 19th century central Europe. This is a goldmine of musical riches, but an incredibly small sample of the music of our current world. String players often start with some of the oldest of this music—early Baroque pieces by Vivaldi or Bach are often some of the first pieces we learn. This separates us in a profound way from our friends who play band instruments. This schism is more than musical—it becomes sociological because music is so sociological. What we listen to defines us among our peers. This chasm between string players and the rest of the contemporary musical world becomes deeper the longer the player sticks with the instrument and immerses themselves in the classical music world. If they become serious and are admitted to a music conservatory, they will become experts in this centuries-old musical language and bring that expertise to their students, valiantly keeping the flame alive and passing on this wealth of musical masterpieces, maintaining an increasingly endangered language. Now, I don’t want to sound dismissive of classical music or imply that we should abandon that important work of passing on this rich legacy. But I think it’s important to recognize, if we’re wondering why we don’t seem to have the same cool groove that a guitar player may have, that classical music-based string pedagogy is increasingly divorced from our own contemporary musical culture of the 21st century—popular songs, the rhythms and style of hip hop, jazz, rock, bluegrass, Celtic music and music from the far corners of the world. To many people, this is not problematic at all—classical music is the music they prefer. That’s fine, but music is intrinsically linked to physical movement and dance and usually falls into a style of one kind or another, and it’s simply more difficult to get physically connected to dances that are completely old-fashioned as opposed to the contemporary movement that is associated with the current popular music that surrounds us. You don’t see a lot of folks Boureeing and Sarabanding these days. This distance from contemporary pop music presents a real challenge if you’re trying to get into a contemporary groove. So part of the solution to bringing our rhythmic potential more into balance with our melodic playing is simply to listen to more pop music. To answer the first part of that initial question: what is the key to connecting with the groove? Not to be facetious, but if you want to connect with the groove you have to play the groove. As string players, we need to pay attention to the rhythm side of our musical nature. Play the rhythm instead of the melody, which means to play the subdivision of the beat, usually 16th notes. I call them Groovons, because they are the smallest particle of the groove. You can’t play an effective groove by playing just the main pulses, usually quarter notes. The groove is created by a pattern of subdivisions of the pulse, in which some are accented and others are not. This is true of drums and percussion, of guitar, of keyboards and anything else playing rhythmically. So, for us as string players, this means we need to learn how to use our bows in a way that allows us to play not only accents but, more importantly, with ghost notes, which are dropped notes—the opposite of accents. It’s tricky to use your bow without making much sound. Your teacher may have taught you how to make beautiful sounds on the instrument, but chances are you never learned how to not make beautiful sounds. Whoever thought that learning how to not play your instrument would be the key to your musical future? If string pedagogy paid more attention to chords—how to play them and how they function within a song or piece—we would have more confidence to be more rhythmic. Cellos and basses at least often play the roots of chords and so get somewhat familiar with harmony, but upper strings often have no clue what is going on harmonically, like a boat on the water that is blissfully unaware of the currents that move beneath it. We are not a non-pitched percussion instrument; we play pitches. So, it’s hard to be rhythmic and improvise subdivision of the beat if you don’t have some idea of what notes to play. We don’t have frets, so the technique of playing 3 or 4 note chords is something we don’t approach until we’re working on Paganini and the most advanced repertoire. But if you pick up a mandolin, which is tuned exactly like a violin, and a book of mandolin chords, you’d quickly see how possibly it is to become a chordal instrument. But for many string players, an even bigger challenge than playing chords in tune is in how to use the bow. For about 20 years I’ve been teaching a method I call Strum Bowing, which is based on the idea of strumming with your bow. (Shameless self-promotion: you can buy it right here at Shar!) It’s my way of teaching string players how to groove. I have seen the incredible resourcefulness in so many young string students who have already found their own ways of adapting the pop music they love and listen to onto their instruments. They are already finding their own solutions to these problems because it’s natural for them to include their instruments in the musical culture they are a part of. Let’s help them and give them some good guidance. Let’s find a more holistic balance of melody and rhythm that more fully expresses not only their own musical culture, but their own musical nature. Lauded by BBC Radio as “the greatest living exponent of the electric violin”, Tracy Silverman’s groundbreaking work defies musical boundaries. Formerly first violinist with the innovative Turtle Island String Quartet, Silverman was named one of 100 distinguished alumni by The Juilliard School and is the subject of several electric violin concertos composed specifically for him by Pulitzer winner John Adams, “Father of Minimalism” Terry Riley, Nico Muhly and Kenji Bunch, as well as the composer of 3 electric violin concertos of his own. He has performed as a soloist with the world’s finest orchestras at Carnegie Hall, Walt Disney Concert Hall, Royal Albert Hall, Avery Fisher Hall, Adelaide’s Festival Theatre, Sao Paulo’s Auditorio Ibirapuera, The Hollywood Bowl and Vienna’s Musikverein among many others. TV/internet and radio include a solo Tiny Desk Concert on NPR, Performance Today, St. Paul Sunday, A Prairie Home Companion and a profile on CBS News Sunday Morning with Charles Osgood. Mark Swed of the LA Times enthused, “Inspiring. Silverman is in a class of his own.” The Chicago Tribune’s John von Rhein raved, “Blazing virtuosity. You will be astonished that anybody can play a fiddle like that” and Anthony Tommasini, New York Times, wrote: “Fleet agility and tangy expressivity with wailing hints of Jimi Hendrix"
A long-standing advocate for music education, Silverman is an in-demand clinician and on the string faculty at Belmont University in Nashville, TN. Tracy's 22 Grove Studies for Strings now has individual parts for Violin 1, Violin 2, Viola, Cello and Bass available for digital download! Download these parts and have your string orchestra grooving in no time!